Family fables should come with a Genealogists Health Warning. So, it was with smiling scepticism that I listened to my elderly uncle, Patrick, relating a yarn that one of his ancestors had changed his name from Gifford to Mills. To my amazement, I found that there was a seam of truth to be mined from his story. Sorry Uncle, for doubting you. My greatx3 grandfather was James Pafford (not Gifford, but near enough to postpone a visit to Patrick by the men in white coats). James married Mary Hambley and they had several children. Between 1818-27, five were christened, Pafford. But by 1841, James and Mary were known as Mills. Persuasive evidence supports the belief that James Pafford and James Mills were one and the same. The census of 1851 shows James and Mary Mills living with two children, James and Eliza whose ages are consistent with the ages of two of the Pafford’s children. The odds against there being a family with four identical given names must be high. Also, James and Mary had a close relationship with John and Susanna Lemmon - they lived near each other and James’ son married John’s daughter. Susanna (nee Hambley) Lemmon and Mary Pafford/Mills were sisters, born at Devonport. The clincher is that three of John Mill’s children were given the middle name, Pafford. A more plausible explanation crosses my fevered mind: John Mills, mutineer, married and had children. After the mutiny, a son, George, changed his name to Pafford (after his mother) and married Mary. Their children, including James were all christened as Pafford. Some time between 1825 and 1841, when time had healed the open sore of the mutiny, James Pafford decided to revert to his correct surname of Mills. There are two reasons offered by members of the Mills for the name change. Patrick Mills thought that a forefather, who was in the navy, jumped ship and altered his name to avoid the consequences. A second version is more detailed. Joan Mills (who married James Pafford’s greatx2 grandson) was told that a Mills ancestor had changed his name because he ‘deserted from the navy. There was trouble on a boat in the Pickman or Pickford Islands (sic). They stayed out there and made their lives there’. She understood that, in the 1920s, a black grandson of this deserter who was seeking his British relatives, visited her husband’s grandfather, Albert Thomas Pafford Mills. For me, this story resounds with a timbre of truth and tallies in essential details with Patrick’s account. ‘At the mouth of two witnesses a matter is proven’. Or maybe Joan had been dreaming about Charles Laughton or, more likely, Mel Gibson. To add some flesh to Joan’s story, there was a John Mills who sailed from Portsmouth on HMS bounty in 1787. He was baptised on 24 April 1749 at carnie by Huntley, Scotland. He was thirty-eight years old when the ship began her voyage - old enough to have married and sire children. John was one of the Bounty mutineers who landed on the Pitcairn Islands (not Pickfords, a removal firm at Portsmouth). He married a native woman, Vahineatua. He called her, ‘Prudence’ - an incongruous name-choice for a renegade. John died at Pitcairn on 20 September 1797, hacked to death by his hosts, but not before fathering two children. 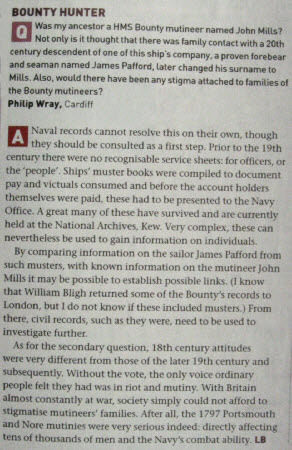 Full pedigrees of the mutineers’ progeny are documented on the Internet and they include the descendants of John Mills. Some of these were alive in the 1920s when Joan says the meeting with the Mills/Paffords took place. In trying to make sense of the fragments of facts at one’s fingertips, one is hamstrung by the many alternative spellings of Pafford. Being a common problem in genealogy caused by illiteracy does not lessen the researcher’s difficulties which are compounded by the variety of surname renditions - a real ‘nom de grrr’. 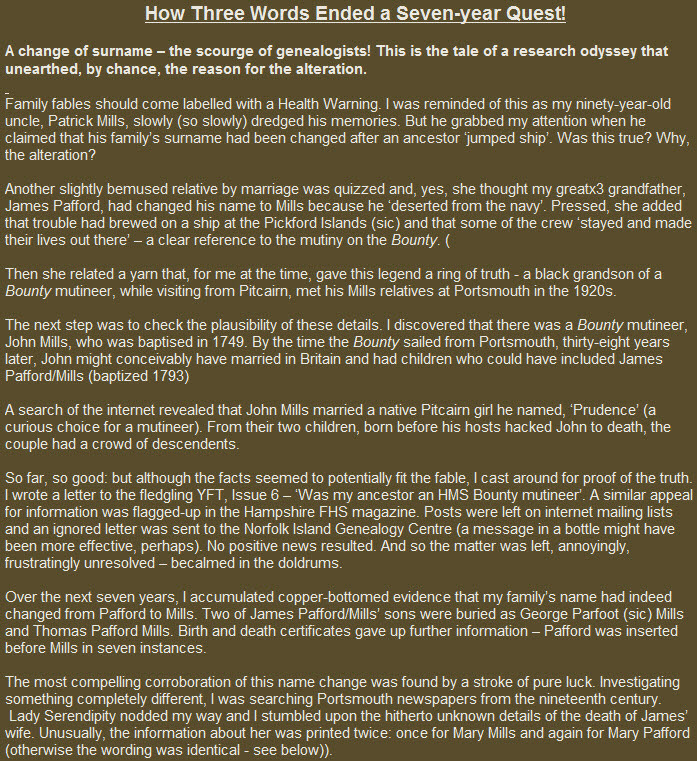 So, we discover Parfoot and Pasford, Tafford and even Perfett masquerading as possible ancestors. James Pafford’s sister married as Charlotte Mills Pafford. George Parfoot Mills and Thomas Pafford Mills were buried at Portsea. The prevalence of Pafford as a middle name has been mentioned already. It was a practice that continued well into the twentieth century. One of James and Mary’s greatx2 grandsons, born in 1919, was christened, Albert Thomas Pafford Mills. Indeed Joan Mills recounts the Mills manipulation that was applied to include Pafford on her daughter’s birth certificate. She preferred Rose Marie. As the Pafford name featured so often among the descendants of James and Mary, we must conclude that there was no stigma attached to it - no Pafford had committed a grisly crime. The main reason that surnames are used as middle names is to perpetuate the memory of a loved female ancestor. So, a child might be christened with its mother’s maiden name. Thus, Mary Pafford’s brother, James Hambley incorporated his mother’s maiden name, Manley, in his children’s name : Thomas Manley Hambley, which has a certain rhythm. Probably, we will never solve the Mills Mystery of the Pafford Puzzle. But on the basis of what has been mentioned some solutions may be postulated: Did James Mills (b 1793c) join the Navy as a boy and then abscond, changing his name to Pafford (possibly using his mother’s maiden name) to escape detection and rejoining the navy before his marriage? This is unlikely as he remained in the same area and surely he would have been recognised and reported as a deserter. James married Mary Hambley at St Mary’s, Portsea on Christmas Day, 1816. The witnesses were Lucy Taylor and William Clemmens. All four signatories marked rather than signed their entries. Finding James marriage document was a stroke of luck as it records him being ‘of HMS Prince’ (shown right). Prince (74-gun, 3rd Rate) had fought at Trafalgar and immediately I wondered whether another family legend was true - that an ancestor had been a powder monkey with Nelson. This information was also potentially helpful as, with a fair wind, if one knows on what ship a man served, it is possible to discover his career details at The National archives, Kew (TNA) But at the time, this was a dead end as TNA apparently did not have the musters or roll call for Prince in and around 1816. Seven years was to elapse before I realised that Prince was no longer in active service but mothballed at Portsmouth Harbour in 1816 and so her records were included in the ledger, ‘Portsmouth Ordinary’.